Best quality homes under Pradhan Mantri Awaas Yojana (Gramin), Awaasoft MIS is managing PMAY-G completely, end to end, including fund transfer and geo-tagging of houses at every stage of construction. The Rural Mason Training programme has moved forward effectively in Maharashtra, Uttrakhand, Chhattisgarh, Jharkhand and Madhya Pradesh. Other States are also speeding up the Rural Mason Training Programme. 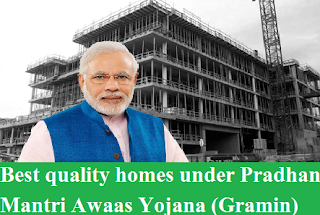 Hon’ble Prime Minister Shri Narendra Modi launched the Pradhan Mantri Awaas Yojana (Gramin) or PMAY-G on 20th November, 2016 from Agra in Uttar Pradesh. Using a variety of designs vetted by technical institutions, local materials and trained masons, carefully selected beneficiaries, who were homeless or living in 0,1,2, kuchcha room with kuchcha roof and kutcha walls, are building the finest quality homes with the enhanced unit cost of nearly Rs. 1.5 lakh through convergence.